Recently I've been wanting to build some shelves for my daughter's room. She has loads of books and I mean loads! Several years ago a local thrift store was moving and wanted to get rid of their book inventory fast. They had all books at .25 cents each. I remember going in and loading a shopping cart up to the top with books. There were tons of kids books that I knew my child and future children would enjoy. I had been keeping a big stack down in my basement. It's time they had a nice home. We now have three children who love to read, it's time! I had been wanting to order a few tools to help with my project, a Kreg Jig being one of them. It just so happens that I got a visit from the Fairy Hobmother from Appliances Online and he has sprinkled my blog with happiness by giving me an Amazon gift card in exchange for a mention. This sounded like fun to me and who doesn't love a gift. I accepted his gift right away and can't wait to pick out more books for my budding readers to enjoy. I'm not the most handy of people but I do enjoy a good challenge. I thought that maybe using some old apple crates would make some easy DIY shelves. I've been scouring the web in search of the perfect idea to use them in. I found some really great ideas on Pinterest and so I thought I'd share a few that I found. 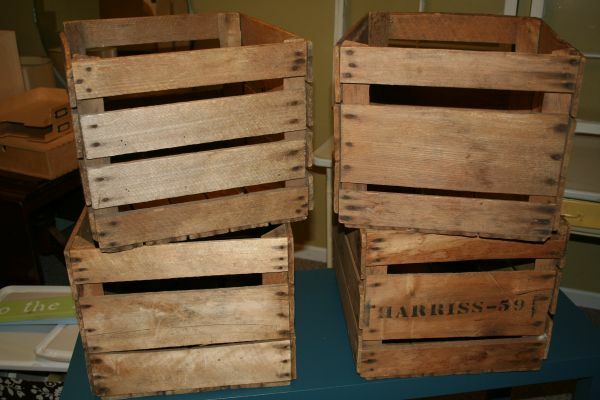 I can get apple crates for $3 each locally so this is a low cost project that will fit neatly into my small budget.